German rabbi; born at Adelsdorf, near Erlangen, Bavaria, Jan. 31, 1803; died at Fürth Dec. 26, 1873. He received his Talmudical training at the yeshibah of Wolf Hamburger at Fürth, and studied philosophy and philology at the University of Munich. He was rabbi of Uhlfeld from 1827 to 1830, when he was elected district rabbi of Fürth. Though his election was duly confirmed by the government (Dec. 1) the opposition of the Orthodox party rendered necessary a decree of installation by King Ludwig I. (March 10, 1831). 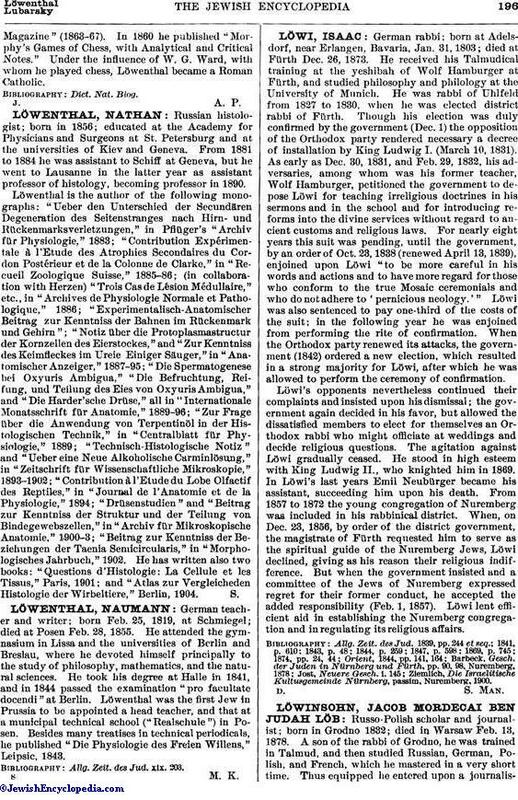 As early as Dec. 30, 1831, and Feb. 29, 1832, his adversaries, among whom was his former teacher, Wolf Hamburger, petitioned the government to depose Löwi for teaching irreligious doctrines in his sermons and in the school and for introducing reforms into the divine services without regard to ancient customs and religious laws. For nearly eight years this suit was pending, until the government, by an order of Oct. 23, 1838 (renewed April 13, 1839), enjoined upon Löwi "to be more careful in his words and actions and to have more regard for those who conform to the true Mosaic ceremonials and who do not adhere to 'pernicious neology.'" Löwi was also sentenced to pay one-third of the costs of the suit; in the following year he was enjoined from performing the rite of confirmation. When the Orthodox party renewed its attacks, the government (1842) ordered a new election, which resulted in a strong majority for Löwi, after which he was allowed to perform the ceremony of confirmation. Löwi's opponents nevertheless continued their complaints and insisted upon his dismissal; the government again decided in his favor, but allowed the dissatisfied members to elect for themselves an Orthodox rabbi who might officiate at weddings and decide religious questions. The agitation against Löwi gradually ceased. He stood in high esteem with King Ludwig II., who knighted him in 1869. In Löwi's last years Emil Neubürger became his assistant, succeeding him upon his death. From 1857 to 1872 the young congregation of Nuremberg was included in his rabbinical district. When, on Dec. 23, 1856, by order of the district government, the magistrate of Fürth requested him to serve as the spiritual guide of the Nuremberg Jews, Löwi declined, giving as his reason their religious indifference. But when the government insisted and a committee of the Jews of Nuremberg expressed regret for their former conduct, he accepted the added responsibility (Feb. 1, 1857). Löwi lent efficient aid in establishing the Nuremberg congregation and in regulating its religious affairs. Ziemlich, Die Israelitische Kultusgemeinde Nürnberg, passim, Nuremberg, 1900.